Ease the discomfort of irritated, itchy scalp while controlling hair fall! Try this intensive hair repair shampoo, the Juicy Chemistry Organic Baobab, Rosemary & Tea Tree Anti Hair Fall & Dandruff Control Shampoo, with double action formula that strengthens hair and improves scalp health. Formulated with rejuvenating baobab, to promote hair growth, along with antibacterial tea tree and anti-inflammatory rosemary, it thoroughly cleanses and soothes inflamed scalp. 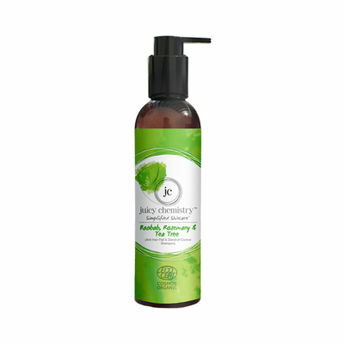 Mild enough to be used every day, the shampoo regulates scalpAlternatively, you can also find many more products from the Juicy Chemistry Baobab, Rosemary & Tea Tree Anti Hair fall & Dandruff Control Shampoo range.